Definition at line 138 of file v3math.h. Definition at line 437 of file v3math.h. 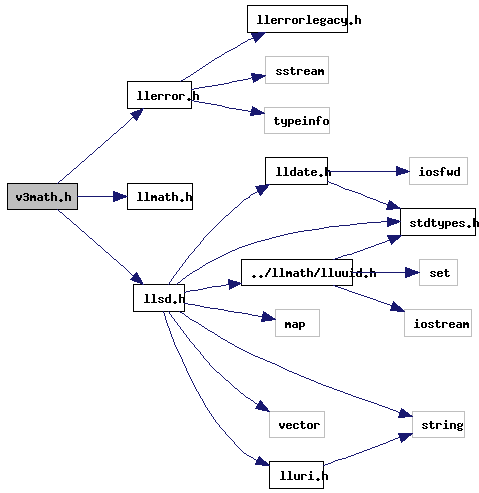 References a, angle, b, f, F_PI, and LLVector3::normVec(). Definition at line 450 of file v3math.h. References a, b, dot(), f, FALSE, LLVector3::normVec(), and TRUE. Definition at line 374 of file v3math.h. References a, b, fsqrtf, x, y, and z. Definition at line 382 of file v3math.h. References a, b, x, y, and z. Definition at line 390 of file v3math.h. References a, b, x, and y. Definition at line 404 of file v3math.h. References a, b, VX, VY, and VZ. Definition at line 293 of file v3math.h. Definition at line 288 of file v3math.h. Definition at line 272 of file v3math.h. Definition at line 352 of file v3math.h. Definition at line 344 of file v3math.h. Definition at line 305 of file v3math.h. Definition at line 277 of file v3math.h. Definition at line 337 of file v3math.h. Definition at line 260 of file v3math.h. References a, b, and c.
Definition at line 321 of file v3math.h. Definition at line 369 of file v3math.h. Definition at line 266 of file v3math.h. Definition at line 329 of file v3math.h. Definition at line 282 of file v3math.h. Definition at line 360 of file v3math.h. Definition at line 312 of file v3math.h. Definition at line 298 of file v3math.h. Definition at line 397 of file v3math.h. References a, b, and LLVector3::normVec(). Definition at line 422 of file v3math.h. Definition at line 46 of file v3math.h.